When snow hits the ground in Metro Vancouver, it’s a given that sometimes it takes a little creativity to get around. At least, that appeared to be the case for one “commuter” in Richmond. 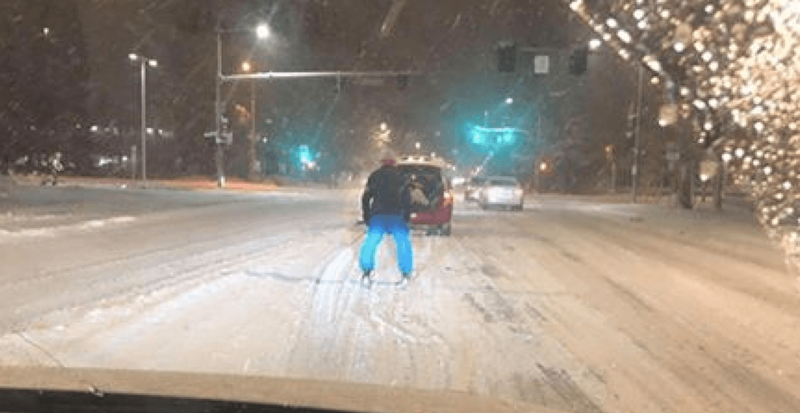 In a pair of videos captured by Chloe Wang, a man can be seen being towed behind a car down a street and through an intersection. Wang told Daily Hive the incident took place around 9:45 pm on Sunday evening, while she and a friend were travelling on Gilbert Road to Granville Avenue in Richmond. While it may look like a novel idea, it’s safe to say this is definitely not a safe thing to do. Instead, if you are trying to go anywhere in this weather, make sure car has snow tires, and watch your speed.